Helsingborg is a town and the seat of Helsingborg Municipality, Skane County, Sweden. It had 97,122 inhabitants in 2010. Helsingborg is the centre of the northern part of western Scania. There is no formal metropolitan area, but the municipality of Helsingborg City and its neighbouring five municipalities (within Scania) had in spring of 2013 a population of 269.489 inhabitants at an area of 1.353 km2, a population density of 200 people/km2. This makes Helsingborg the fourth largest population area in Sweden The city is also Swedens closest point to Denmark, with the Danish city Helsingor clearly visible on the other side of the Oresund about 4 km (2 mi) to the west, closer than to the citys own remoter areas. If including all population around the northern part of Oresund, as a Helsingborg-Helsingor metropolitan area, its population increases to 732.450 at an area of 2.802 km2 The busy ferry route, known as the HH Ferry route has through history been operated by several shipping lines. As of 2014 more than 70 car ferries departures from each harbour every day. Between 1912 and 1971 the name of the town was officially spelled Halsingborg. Historic Helsingborg, with its many old buildings, is a scenic coastal city. The buildings are a blend of old-style stone-built churches and a 600 year old medieval fortress (Karnan) in the city centre, and more modern commercial buildings. The streets vary from wide avenues to small alley-ways. Kullagatan, the main pedestrian shopping street in the city, was the first pedestrian shopping street in Sweden. Helsingborg is one of the oldest cities of what is now Sweden. It has been the site of permanent settlement officially since 21 May 1085. Helsingborgs geographical position at the narrowest part of Oresund made it very important for Denmark, at that time controlling both sides of that strait. From 1429 Eric of Pomerania introduced the Oresundstolden (the Sound Dues), a levy on all trading vessels passing through the sound between Elsinore and Helsingborg. This was one of the main incomes for the Danish Crown. The crossing traffic was like fishermen not submitted to pay the dues, it was a tax initially directed against the Hanseatic League. The Sound Dues made primary Helsingor to flourish, but not so little spilled over also to Helsingborg. The northern narrow inlet to Oresund with its relatively high coatlines made impression on many mariners, and when Kronborg during the Renaissance was rebuild from a fortress to a Palace the area got famous. A proof of this is William Shakespeares masterpiece Hamlet, which is unfolded at Kronborg. And the Prince of Denmark could well have hidden himself from his evil uncle in Helsingborg. In any case, the Renaissance was a good period for the Kingdom of Denmark. But towards the middle of the 17th Century, dark clouds appeared from the North. Following the Dano-Swedish War (1657-1658) and the Treaty of Roskilde Denmark had to give up all territory on the southern Scandinavian peninsula, and Helsingborg became submitted to new rulers. King Charles X Gustav of Sweden landed here on the 5th of March 1658 to take personal possession of the Scanian lands and was met by a delegation led by the bishop of the Diocese of Lund, Peder Winstrup. At that time the town had a population of barely 1,000 people. He soon attempted to erase Denmark totally from the map, by attacking Copenhagen but failed (Treaty of Copenhagen (1660)), and passed away in Gothenburg soon afterwards. Not much changed for some 15 years, but as Charles XI was declared of age, many processes began. As the new king indeed was unsatisfied with his former rulers (Known as "Formyndarrafsten" in Swedish history). The new situation, being a border town, caused problems for the town. The days of conflict were not over. Denmark made two recaptures of Scania, but couldnt hold it. The last Danish attempt to regain Scania was in 1710, when 14.000 men landed on the shores near Helsingborg. The Battle of Helsingborg was fought on the 28th of February just outside the city, which was badly affected. It took a long time to recover, and in 1770 the city had 1321 inhabitants and was just slowly growing. On the 20th of October 1811 Jean-Baptiste Bernadotte, Marshal of France and crown prince-elect of Sweden (later king Charles XIV John) took his first step on Swedish soil in Helsingborg on his journey from Paris to Stockholm. From the middle of the 19th century onwards, however, Helsingborg was one of the fastest growing cities of Sweden, increasing its population from 4,000 in 1850 to 20,000 in 1890 and 56,000 in 1930 due to industrialization. From 1892 a train ferry was put in service, connecting Helsingborg with its Danish sister city Helsingor. A tramway network was inaugurated in 1903 and closed down in 1967. Plans are underway to reintroduce trams in the city. 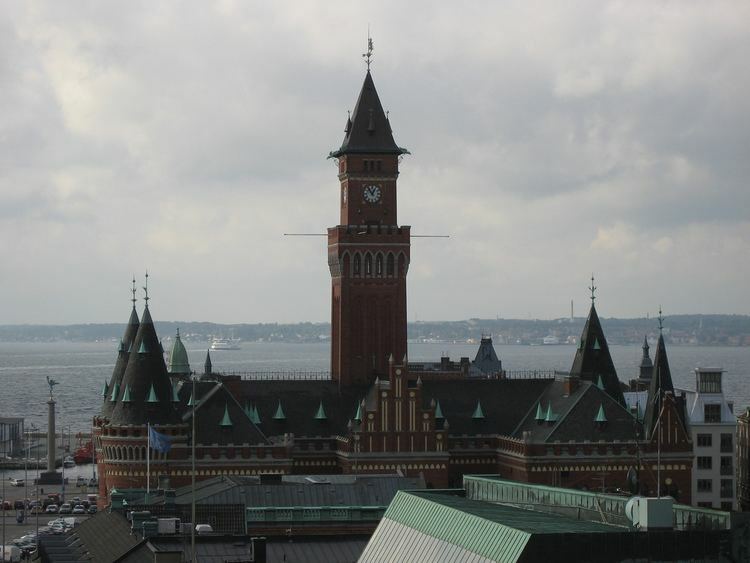 Helsingborg is a major regional centre of trade, transport and business. In 2001 Campus Helsingborg, a branch of University of Lund, opened in the former Tretorn rubber factory buildings, originally founded by Henry Dunker. Three ferry companies take people and cargo to and from Denmark around the clock. The route is popular with day-trippers going to Elsinore or Copenhagen, or simply enjoying the views from the ferries. IKEA, the retailer of furniture and home interiors, has its international corporate headquarters in Helsingborg. Nicorette, the nicotine chewing gum, has a manufacturing plant there. Ramlosa is a mineral water from Ramlosa Brunn, a southern suburb of the city. Mobile phone developer Spectronic is also situated in Helsingborg. The online custom clothing retailer Tailor Store Sweden AB has its offices in Helsingborg.